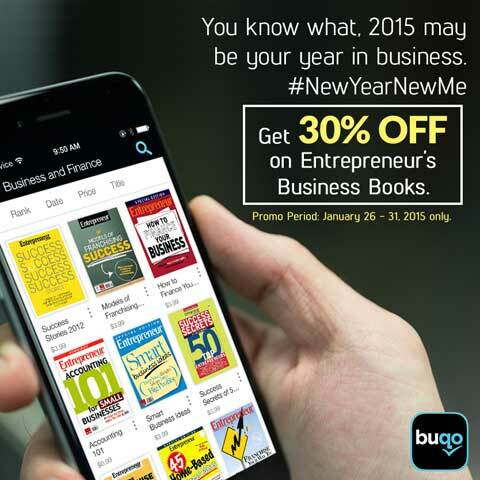 Enjoy a wide array of Entrepreneur titles at a special discounted rate. Whether you're a start-up entrepreneur getting a business idea off the ground or a thriving businessperson running a franchise concept, it pays to brush up your business know-how. Over the years, Entrepreneur has produced special publications that aim to address the needs of those in business by providing titles that cover helpful business ideas, guides for finance and accounting, and inspiring success stories. These special publications are available on buqo, a Filipino digital bookstore, newsstand, and reader all in a single app. And for a limited time, the Entrepreneur special publications along with other business book titles are at a special discounted rate of 30% off. Download buqo via iOS or Android, or you may purchase the titles from the buqo webstore and read the titles on your device. You can even use your Smart load or credits or charge to your postpaid account for a more convenient payment option. The promo runs until January 31, 2015.